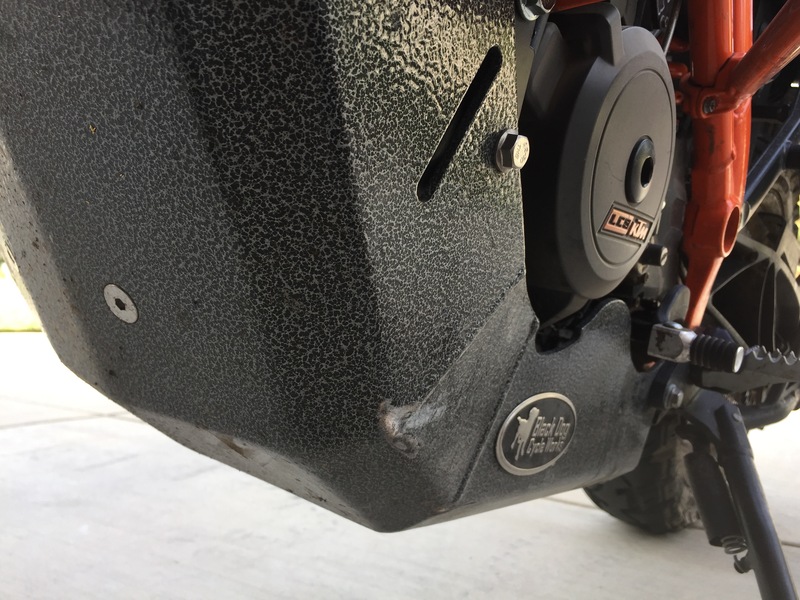 I struggled to spend $600 on a skid plate, but I really wanted the extreme protection and the kickstand relocation. Since I actually pummel my 1190 in the dirt I wanted the standard 1190. The standard 1190 seat can be lowered by 1", the suspension is 1" shorter so I get a much lower center of gravity, and the front and rear tires are 1" wider than the 1190R so i get the most rubber to the dirt. But that lower center of gravity means 1" less ground clearance than the 1190R. Plus I often let guys borrow my bikes and who knows what they are capable of! Since I am the 53 year old guy that still has his high school car, my kid drives my 30 year old LeBaron Convertible and I even kept the same girl I started dating when I was 15, I figured the $600 for the skid plate amortized over "forever" made it a prudent investment! I originally bought Version 2 but the lower ground clearance of the standard meant I often caught logs on log crossings. The squared off front area on Version 2 was a bit difficult to slide over rocks with. Often I would roll back, pop clutch and then come crashing down on the bottom of the skid plate then slide forward so the rear wheel would power me over the log. The newer Version 3 is more rounded so it appears it will be less likely to catch on the leading edge of the skid plate. I am hoping it will just allow me to slide over the log in one swift motion vs stopping and bouncing. I am not sure Version 3 will be as easy to remove as Version 2 was (which was super easy), but I was more concerned with getting hung on logs than my removal time. Version 3 is a bit lighter, maybe even a bit less protective, but also has reinforcement on BOTH sides of the curved areas which would protect the engine cases. It is slightly narrower and generally seems to be tighter fitting as it appears to of "hit the gym" and lost some mass. The final benefit is it prevented my buddy - who has significant mass to him - from buying a wimpy looking basic aluminum skid plate for his 1190R. I sold him my Version 2 as ground clearance is less of a concern for him and he does not pound his 1190R near what I do. I cringe as I watch him climb on his 1190R with the kickstand down and pray he does not snap the kickstand out of the side case. 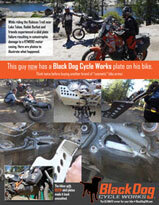 So Version 3 really is different and I applaud companies like Black Dog that have continuous improvement. Naturally, instructions, shipping and workmanship were the same as always - perfect!